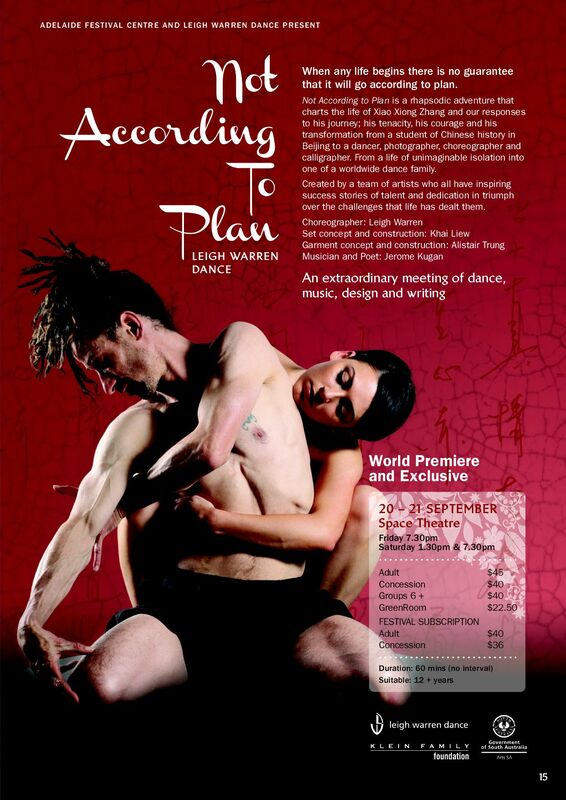 Leigh Warren Dance returns to the OzAsia Festival on 20-21 September with Not According to Plan – one of the year’s most fascinating design and dance collaborations. Celebrating 20 years producing some of the nation’s most innovative cross cultural and artform collaborations, Leigh Warren has assembled another inspiring group of artists, dancers and designers. Internationally acclaimed furniture designer Khai Liew, renowned fashion designer Alistair Trung, Malaysian poet / composer Jerome Kugan and Barrio creative producer, Geoff Cobham join Taiwan-based internationally distinguished dancer, choreographer, photographer, calligrapher and academic, Xiao-Xiong Zhang who’s incredible life journey is the inspiration for the work. Zhang’s life is a remarkable story of dedication, tenacity and courage and I was fortunate enough to work with him as one of his early mentors and teachers at Australian Dance Theatre, Mr Warren said. “He prevailed as a student in China during the cultural revolution and later as a dancer in Australia and internationally despite his early hardships and years of separation from his Cambodia-based family during the war,” he said. “Khai Liew and Alistair Trung share a similar story of triumph after being forced to flee their Asian birthplaces and their family early in their lives so I’m enthralled to see where that common life experience and design synergy will take the work. “Khai’s set and concept contribution will see a stunning piece of large scale timber design artwork form the foundation of the set while Alistair’s celebrated minimalist zen-like garments will be a sight to behold, enhancing the flow of the dancer’s movements.” Mr Warren said. Joining Xiao-Xiong Zhang on stage to perform Not According To Plan will be two of his protégés from Taiwan in Chien-Wei Wu, Yuan-Li Wang alongside dancers representing bookends of LWD’s 20 years in Aidan Munn – one of LWD’s founding members – and Bec Jones – the award-winning company’s newest and youngest dancer.